I have a confession to make. I love Taco Bell. I mean serious love here. I love it so much that before I went vegetarian I had to check Taco Bell's website to make sure that the beans were, in fact, vegan/vegetarian because the idea of giving up meat was completely fine but the idea of living without Taco Bell? To quote Fezzik from the Princess Bride, "Inconceivable!" Is it the healthiest love? Probably not, but it's a love of the deepest, purest, truest kind. So with my weakness for this blissful creation in mind, I knew that if I was ever going to fully commit to being vegan (and be able to keep at it) I'd have to find a way to replicate it with a vegan twist. 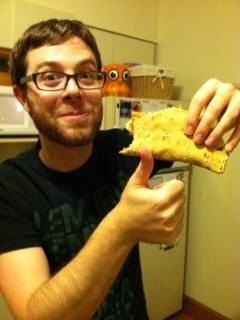 And thus began my journey to veganize the Cheesy Gordita Crunch. I was ecstatic to find that all that needed to be changed was to substitute Veganaise for the regular mayo and get moving! Then I just needed to take care of the beans, meat, cheese, lettuce, tomatoes.... Ok, it sounds like a lot - I'll just post my recipe and break it down that way. So here you go, my vegan Cheesy Gordita Crunch (apologies ahead of time for the photos - hopefully one day I'll have a grown up camera and a kitchen with better lighting). First things first, if you're making your own refried beans you're going to need to get them started just about first thing in the morning so make sure you plan ahead. The recipe says it takes about 3 hours and 45 minutes, but we put our beans on at 2:30 and there were barely ready at 10 (in fact we had to save the "re-frying" aspect of this until the next day because I like my sleep) so again, this is where canned refried beans come in handy. 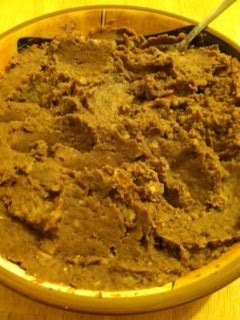 If you have a favorite refried beans recipe I say go with that. This one in general was a bit bland for my taste and I ended up adding a lot more spices into it to give it more of a kick. I'm sure if you soaked these bad boys overnight you'd have a better experience - as for me, I'm sticking to the canned from now on until someday when I'm feeling newly adventurous and less hateful towards pinto beans from scratch! Now onto the actual cooking! Get the baja sauce out of the way and into the fridge so the flavors can settle together! Get started by seeding and chopping your red bell pepper. Don't worry about being precise with the chopping since it's all headed for the food processor anyhow. Then it's off to the food processor to puree the mixture until it's evenly mixed and smooth. Mix up four tablespoons of the pepper/onion mixture with the Veganaise. Don't be worried if it doesn't taste EXACTLY like you think it should, the flavors still need to sit. Put that sucker in the fridge and go take a nap, get a drink, watch some Saved by the Bell reruns, you know, the usual. Start getting the rest of the food ready about half an hour before you want to eat since it all comes together pretty quickly (isn't that the beauty of tacos?). Set up hard taco shells on an ungreased cookie sheet. Make the taco meat by placing the package of frozen crumble into a skillet over medium high heat. You'll want to break up the crumble as much as you can. Next add in about 2/3 the packet of taco seasoning (you can add more or less depending on your taste) and add about 2/3 cup water. Mix thoroughly and heat until the water is completely absorbed and the crumble is heated through. This should take 10 minutes max. Feel free to add a little more water as you see fit depending again on how strong you want the flavor of the meat to be. Once done, remove from heat, cover, and set aside. Bake hard taco shells in the oven for about 5 minutes or until crisp. Make sure to watch these so they don't burn. Remove from oven and place on a plate covered with tin foil to keep warm. Once done, set oven to broil on low. While the crumble is cooking and the shells are baking, shred your lettuce and chop up your tomatoes for the topping. Mix together a cup of the pepperjack shredded cheese and a cup of the cheddar shredded cheese. Lay out your gordita shells on a baking sheet covered with tin foil. Sprinkle generously with the pepperjack/cheddar combo. Place the gordita shells in the oven on broil just until the cheese is melted. Be sure to watch these as you don't want them to burn or the shells to get crispy! It should only take a minute or so. 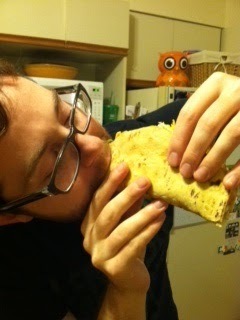 Place the heated hard shell on top of the soft gordita shell and push together. You may want to hold for a minute or so until the melted cheese keeps them together. 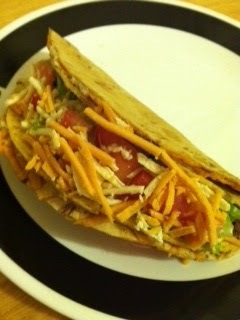 (*The flatbread was a bit larger than the hard shells so I had to use a pizza cutter to make it smaller to fit*). Add a layer of the meat, followed by the refried beans, lettuce, baja sauce, tomatoes, and finally sprinkle lightly with the leftover pepperjack/cheddar cheese combo. TADA! You have a delicious, vegan version of the Taco Bell classic. Was it exactly like the original? Not quite. But was it enough to stop my cravings for one? Hell yeah. I think using the gordita shells instead of flatbread would make a huge difference and I may scale back a bit on the jalapeno in the baja sauce next time or maybe try to add some vegan cheese to the sauce itself (like I've seen in other recipes), but all in all it was damn delicious and Seth's plate was cleared and he was up for seconds in no time.